You know it had to happened. 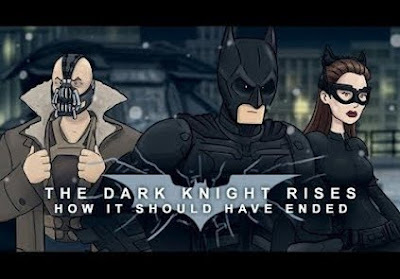 The folks from HISHE (How It Should Have Ended) takes on Christopher Nolan's swan song to his epic Dark Knight trilogy. There is no doubt that The Dark Knight Rises, Christopher's final chapter to his mega-successful Dark Knight trilogy has been the subject of many a film (and comic book) enthusiast since its release. While most shared the opinion that while it didn't exactly lived to the impossible hype of following up to the phenomenal The Dark Knight, it is definitely a worthy and satisfying end to the the best superhero film trilogy ever. We are pretty sure the talented folks at HISHE (How It Should Have Ended) agreed with these humorous parody that are not exactly spiteful in their nature. Hit the jump to check out the hilarious clip.